At Glide we take a different approach to helping you attract more customers. We know that the investment you put into your leafleting campaign has to reap rewards. And you need to measure exactly how well your campaign is performing. 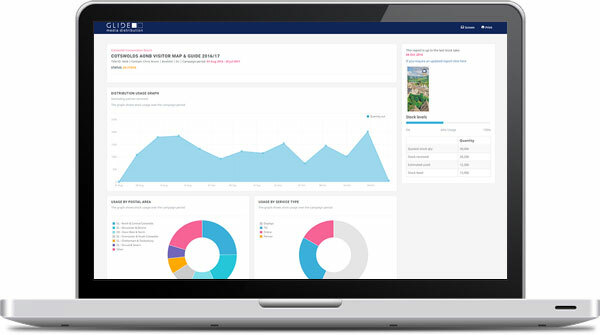 With this value at the core of our business we have developed a unique and unrivalled customer reporting and analytics tool providing mapped coverage, graphs and charts to give you a real time overview of the progress of your campaign. We provide this easy-to-use reporting facility at no extra cost because we know that – like any other marketing activity – your results will be far more valuable if you can measure your campaign. This reporting system will not only keep you up to date with your promotion but also provide vital information to feed into to your overall marketing strategy, helping to produce a better return on your investment and an increased footfall to your attraction.